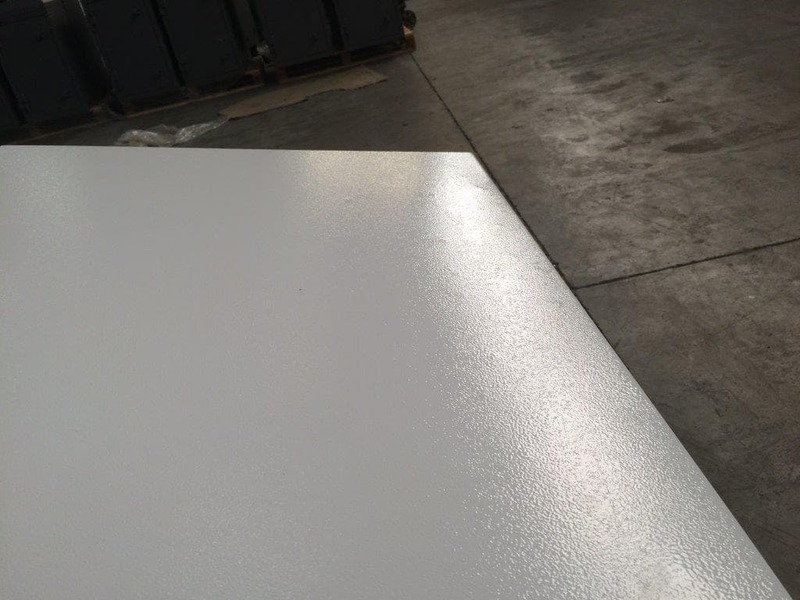 We have been experiencing blotches when powder coating various products, it seems that it is only when using a texture powder. And from various suppliers, we have had sales reps to come with new guns and we still have the problem. 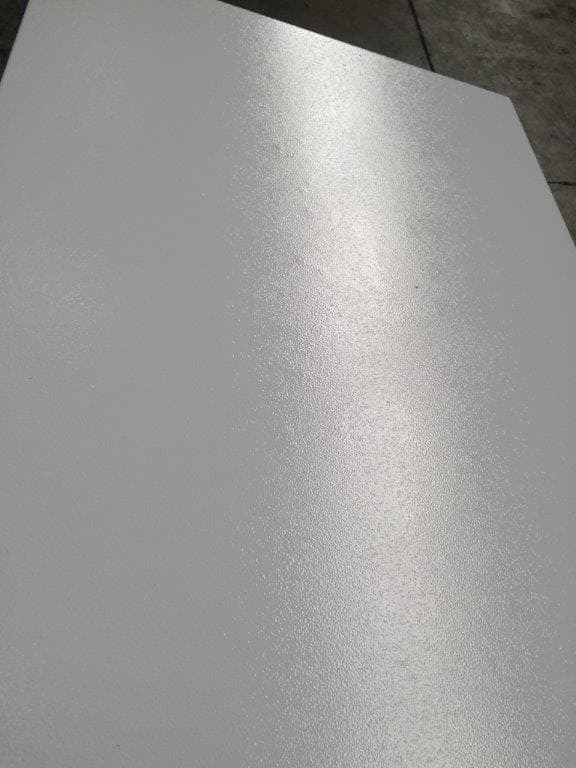 We have found that it is more on prepared surfaces like grinding or brushed material from steel supplier. You can only see the blemishes when you look at the product from an angle. There are several potential causes of this problem. (1) Maybe you have a defective batch of powder. This unlikely but not unheard of. (2) Maybe you are using a vibratory feed hopper rather than an aeration system? Special effects powders be they ripple or metallic or texture have to be aerated adequately. (3) Maybe your air supply is inadequately filtered of liquid? do you have a well maintained and refigerant cooled air supply? These are the three most obvious answers to your problems. (1)	When the problem first occurred we got our suppler out (their technical department )and painted panels with them. They also had the test equipment to test the static of the units (all okay) they took a sample of powder back to the lab for practical testing (all okay). As you said, don't believe it is the powder (but was checked). (3)	We have Kaeser compressors with the appropriate air dryers in place as we have highly moisture sensitive equipment in our factory that is all fed off the same air line (laser cutting machines). We have also done the mirror test on our air lines at the points of painting and it was all dry and okay. When we did tests with our supplier we took a mild steel plate and only polished a strip down the middle (so you had virgin material on each side and a polished piece in the middle). The blotches were only where the surface was polished/ground (we had the sandpaper supplier out as well, no problem there). 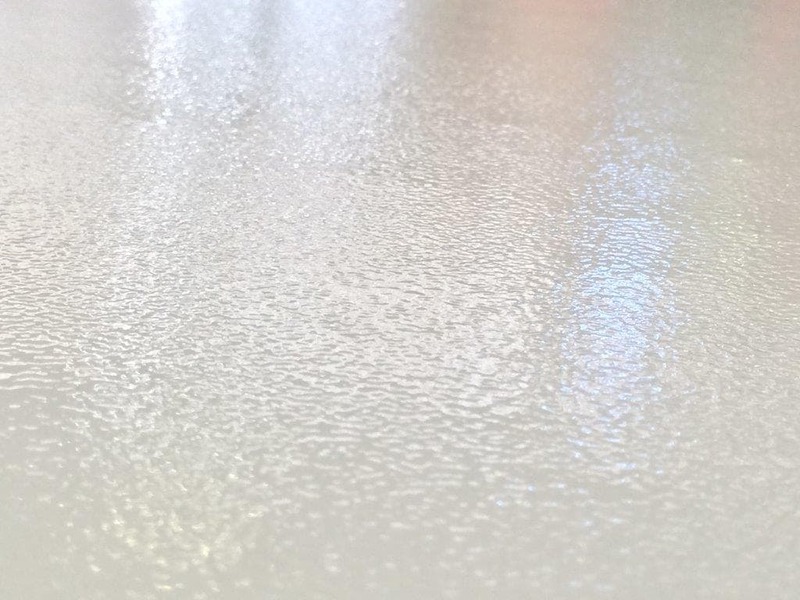 The blotches have also occurred on brush finished stainless steel (rough surface); we have never had blotches happen on untouched surfaces (cut and bent parts). 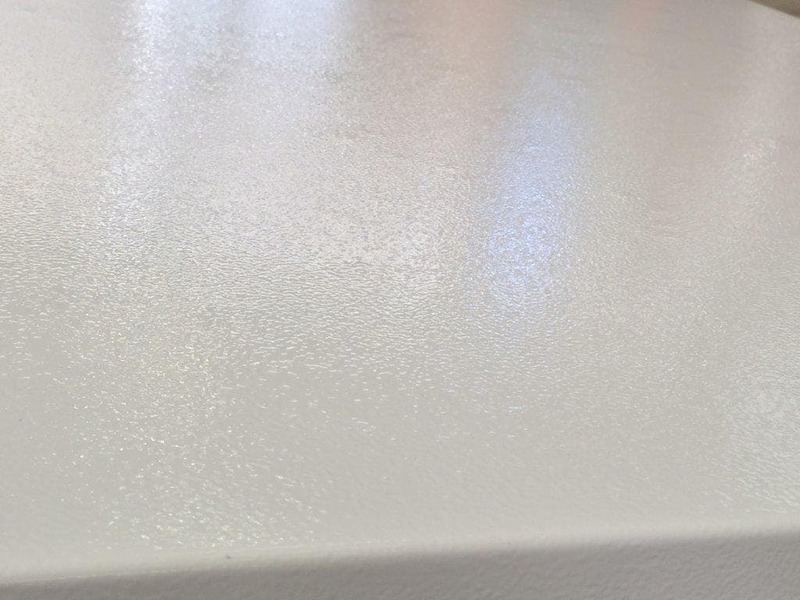 The blotches only happen every now and then and only on surfaces that are rough; this is very confusing for us as we and our supplier have not come across this in the past. Hope the new information helps and your input is highly appreciated. I find the last two paragraphs of your response puzzling. Am I right in concluding that only the polished (or sanded) section on one occasion has the flaw but on another occasion the flaw is on unpolished (not sanded) surface? I really think you should try a full on aeration hopper scenario for the special effect powder you are using. Metallics can be bonded or not in formulation. Textures, ripples etc, I do not believe can be. Give an aeration hopper a try if only for special effects and please advise your result. I will have to get hold of our gun suppler and get a demo gun to try (worth a try ). A. I like Bill's suggestion of aeration stirring rather than vibratory. 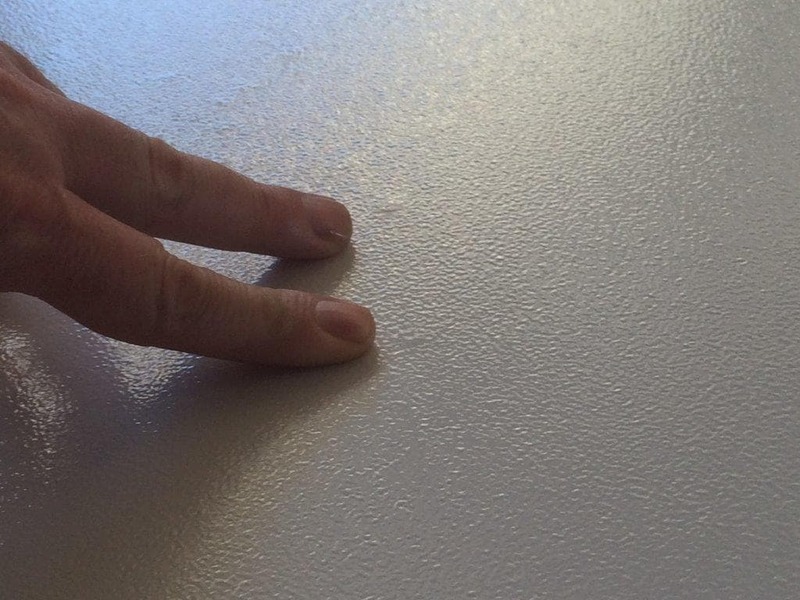 We've found that vibration causes many problems in special effects, metallics, and textures. Air fluidizing solves most of them. A. You only need a fluidising hopper. Your gun and the rest of your gear could remain. A fluidising hopper is a cheap and easy construct. I am really interested in your result, please publish. Since my last post I have had a demo from Gema of their fluidise unit with the hopper. Been running it for a weak in my batch line. I have compared the work from the batch (hopper unit) to the work from our other two conveyer line (vibrating units). I cannot see a difference in the finish of the end product in structure, hammertone, texture, and metallic colours (special effects powders). I still can't see what will cause the blotchiness. Thank goodness it has only happened twice this year. Interesting situation. I am by no means a pro at paint, but I am involved in paint adhesion testing wet/dry with primers and epoxy top coat for aerospace. You mention this is new metal. What is it and what are the previous metal compositions? "This is new metal and it's clean, so no grease or polish on it, etc." Can you verify? 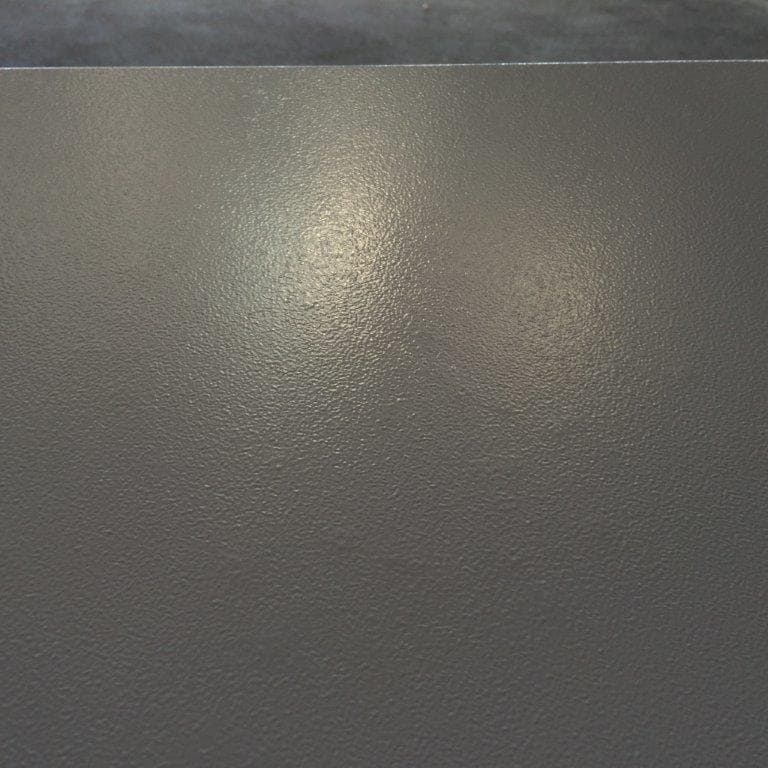 Do you have a process to clean prior to paint, and does the part exhibit a water break free surface before paint?. It looks like the paint is not "biting/adhering" at the edges which are not sharp, and at the perimeters of the holes, and as you say it is pooling at the bottom. Are you dipping or spraying? Obviously you are confident with the viscosity. Have you done a paint adhesion test on these parts? By new metal I mean that it hasn't been used for its intended purpose yet. So in this case no bearing grease, etc. As for the type of metal it's aluminum; it was cleaned just with water then out gassed in case there was any cutting solution on it from the CNC machine that made it. I lightly rubbed it with triple 0 steel wool and washed again. I have powder coated many things and only in the past few months have I tried the transparent top coats. This one being a copper, there is no base coat under this and the manufacturer said I didn't need one. I did try putting a metallic base powder under it and had the same issue, again doing so under the manufacturer specifications. Just so stinking frustrating since removing powder coat from corners can be a nightmare. So any help is good help at this point. And thanks for taking an interest in my problem, Eric. I do not understand that it was just cleaned with water and out gassed. I am having a problem with the STEEL WOOL on aluminium and washing again. 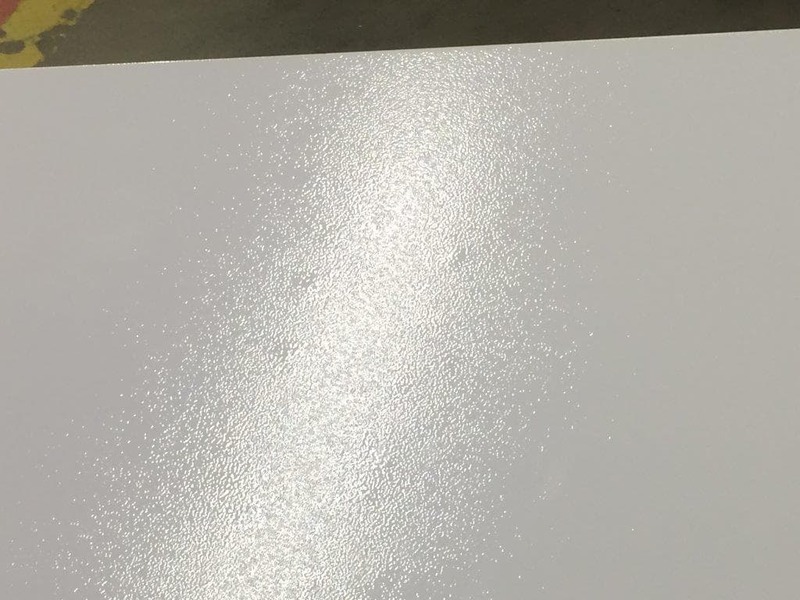 Since this is a "new" metal, (is this the first time processing aluminum?) perhaps this is a situation where the cleaning chemistry (powder coat) is not compatible with the aluminum. Your alternate metallic base also proved negative. When I have issues with paint (we process aluminum as spray), I process the items with a pre-anodize cleaning process. It involves a wash/wipe with MEK (that is ONLY what is allowed following specs), MILD alkaline soak (high caustic/high pH will cause you grief), to remove any trace of "exotics", and a deoxider to deal with any oxides, if there are any, based on the alloy. Maybe I missed the train. A. Your coating is too low in viscosity, or is applied too thick. Try two layers, each half as thick. Let the first layer air dry before applying the second. If you do not see the problem prior to bake, the coating may be thinning as it begins to heat in the bake oven. You can try air drying to let it thicken up a bit before baking. Your part looks like the armature for an ignition coil. 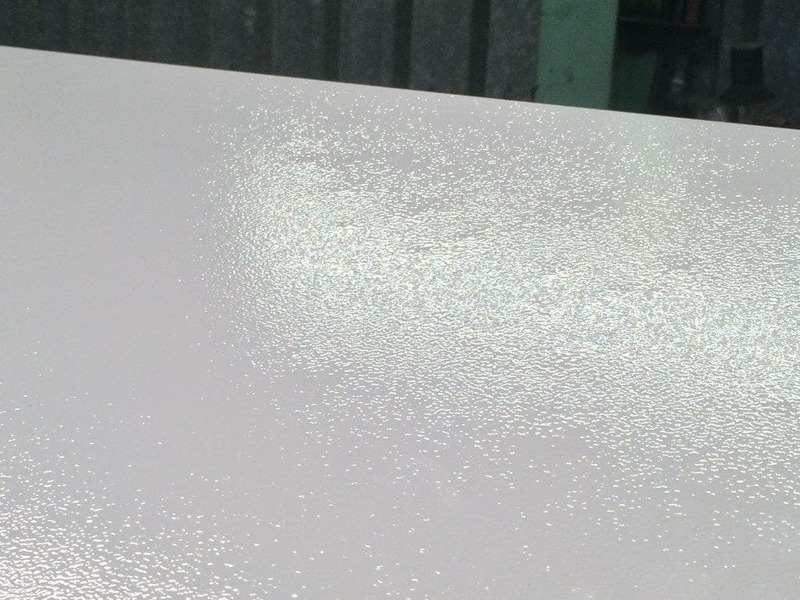 Most mfrs of those use precoated sheet and don't bother to coat the edges at all. Q. Hi, my question is in powder coating. Aesthetics is the major problem or what? How to reduce that problem? Q. We are having issues with rough edges and some bubbling when spraying metallic powder onto aluminum castings. Part process is: 3 stage washer - dryoff oven - robotic powder epoxy prime - oven cure (parbake) - robotic topcoat powder (bonded uerethane metallic) - oven cure. While the majority of the part comes out great, a thin fin coming off the part will either have a rough abrasive edge, or a slightly bubbled edge. We have experimented with several powder flows, and electrostatic settings. We are able to eliminate the bubbles by lowering the Topcoat film build. But then the rough edges turn up. Occasionally, we will turn out a rack or so of good parts, then slowly back to rough edges. Lowering the electrostatic KV and Ua levels seems to make things worse, while high KV seems to help. At a loss. A. Hi Chris, you are obviously looking to a high quality protective finish and, by the sounds of it, working well towards that. That said, it would be very helpful to view photographs of the problems. I trust that your powder delivery system for metallic is aerated rather than vibratory? Please provide photographs to allow any constructive further advice. Q. Hi guys, we have a problem that, after the supplier sent in the parts, when we are about to use it we found that there is serious rubbing marks (black) on the powder. I would like to know what is the root cause of this rubbing mark? FYI, we are facing this issue when we rub the parts with a clean soft cloth. Is this because of the quality of the powder or what? Please add the photos that will maybe explain the problem. Your Q, A, or Comment: hi. I have a problem like spiderweb on my finish ... why? It's happening only with white. Q. I have cured powder that is not adhere to the metal, peals at the edge and comes off in strips. This material has been through the wash system and it is checked twice daily. Only one set of parts seem to have this problem but I am concerned other parts my fail an adhesion test. A. Poor adhesion can be attributed to so many factors, and you haven't really given much info here. You mentioned a "wash system". What is that? just water (doubtful), but at a distance we can't tell to be able to suggest much. What chemistry does your "wash" include? It is a cleaning only? conversion coating? Other? Cure cycles? Temp? Time? Heat transfer method? (Infra Red or how air)? Metal? What are you coating? Aluminium, steel, stainless steel? Bronze, galvanized steel? Copper? Titanium? And what shape is the metal? Thin sheet? fabricated from plates? Lengths? castings? And are these different to those that you have no problems with? How? Do you do any tests for adhesion? How? scratch? cross hatch? pull-off? Do you test for cure? How? More info and you might get a much more useful answer. Pictures too and you bring us right with you to see the problem!